A dark cloud appeared over Buckingham Palace on The Mall an hour before the race start, dropping its contents in a thunderous downpour. Although the rain eased before the start it came on again hard in the early kilometres and seemed to dampen anyone's enthusiasm for a fast early pace. After a short 3.5km first lap more than half the field of 118 starters passed through 5km within nine seconds of 17:20 posted by early leaders Kara Goucher and Shalane Flanagan. Along the Thames Embankment and around a twisting lap in the City of London, things remained the same: the rain did not ease, but the pace did. The second 5km split was 17:26, and 40 runners passed through within three seconds. One consequence of the slow pace was that when Tiki Gelana fell at a drinks station — all three Kenyans and Ethiopians were at the head of the field — she was easily able to work her way back to the front. Things remained steady as the leading group gradually reduced from 40 at 15km to 28 at 20km. By halfway, passed in 1:13:13 on the second time around the City loop, the pace was edging up with a 16:57 split from 20-25km leaving a tight-knit group consisting exclusively of the three Ethiopians and three Kenyans. Last year's leading performer Liliya Shobukova had already dropped out but as the pace stayed strong with a 16:21 split from 25-30km her team-mate Tatiana Petrova remained only nine seconds adrift, while this year's third fastest performer Aselefech Mergia had dropped well behind. As the streets of London were bathed in golden sunshine the world leader and race favourite Mary Keitany led for much of the third and final lap but she never moved decisively enough to open a gap. As the 30-35km split dropped to 16:45 Petrova made up the deficit to lead at 35km, as Mare Dibaba and Edna Kiplagat both fell back. 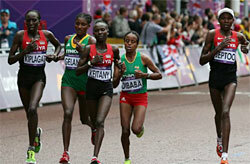 The group of four now consisted of Keitany and her team-mate Priscah Jeptoo, Petrova and Gelana. Although Gelana forced the pace over the final four kilometres, all the way along the Embankment towards Big Ben it appeared to have little effect. Then with 1200m to run Mary Keitany slipped back, but the colour of the leading trio's medals had yet to be decided. Gelana never relented and drove strongly past Buckingham Palace along the 400m finishing straight to take a deserved victory. Of the five women to ever have broken 2:19 two never made it to the start line, and one dropped out. The slowest of them, at 2:18:58, vanquished her more favoured opponent in the final mile, setting a new Olympic record even in such unfavourable conditions. Behind her seven national national records were broken (UKR, NAM, PER, BDI, COL, MNE and TUN). The men's marathon played out in very different conditions to the women's event held a week before, but some things remained the same. There was no rain and fresh early-morning conditions evaporated before the 11:00 start. The sun shone brightly as spectators lined both sides of the course 12-deep, but runners felt the effects quickly, the lead group seeking out any shade on the course before they had got more than 15km into the race. It was a similar cautious start as after the first 3.57km lap, 59 of the 105 starters passed through 5km within 10 seconds of the leader, pre-race favourite Wilson Kipsang (15:23). Going into the first half of the bigger loop in the City of London, Brazil's Franck De Ameida then went off the front, but no one among the 35-strong lead group made much effort to close the gap — which stood at eight seconds as Almeida passed 10km in 30:38. After taking the turn on Tower Hill Kipsang reappeared at the front, and powered into a lead which all had to take seriously. Past Big Ben and nearing the end of the first large lap, with 15km elapsed (44:58), he had won a lead of 13 seconds over a chasing group of eight, albeit in a major exertion of effort. Kipsang stayed clear and held a slightly increased advantage over six others at halfway (1:03:15 to 1:03:31). But halfway signalled a subtle change in the race dynamic: up to that point Kipsang had attacked and was on Olympic record schedule, but from here on in - despite surges from the lead players — it was a battle of attrition against the increasingly warm conditions: everyone started to slow down. Kipsang's lead dwindled to seven seconds at 25km, and the overall pace had slipped just outside an Olympic record (2:06:36). It was a marginal change, but betrayed the way the race was to drift. Starting the last lap, as the four leaders passed through Trafalgar Square (30km), Kipsang had been joined by teammate Abel Kirui and Ugandan Stephen Kiprotich, but the pace was now 2:07. The same three were together right through to about 37km as the overall pace dropped another minute from the schedule. 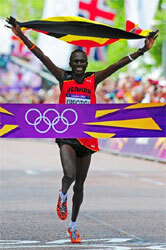 On the final climb of the course Kiprotich made a decisive move, climbing a 10m rise in 200m of road as they swung away from the River Thames past the Monument (marking the outbreak of the 1666 Great Fire of London). Kirui gave chase, but all along the Thames Embankment the three were now strung out in the same order in which they were destined to finish. Up until 40km Kiprotich was on the same pace he had been at 35km, but with a secure gap now established he slowed as he circumnavigated St James's Park and glided past Buckingham Palace for his triumphal procession up The Mall, while the gaps behind him grew. The race started at 17.00 — timed to be simultaneous with the men's Olympic Marathon being held in London six time-zones to the west. The day was hot with the temperature at the start being 36°C. The elite men gradually all dropped out between 15–30km, leaving first-timer Nikolai Grigorov in the lead, to take a victory in his debut marathon. The elite women proved more resilient, particularly Olga Mazurenok, who finished 15 minutes ahead of her fellow Belarussian the veteran Alina Vinitskaya and almost five minutes ahead of Grigorov. Alesya Shmuklina also took overall victory in the 10km, her finishing time being one and a half minutes faster than the male winner Mikhail Gulik. Italy's new marathon record holder Valeria Straneo set a new course record, leading home compatriot Anna Incerti by 100m. With Rosaria Console in fourth it was a good pre-Olympic tune up for the Italian women. A group of 10 runners exchanged the early lead in the men's race. Then the 19-year old Kenyan Kiprop Limo moved to the front, reaching 7km with Ethiopian Zelalem Regasa who then broke away with only Limo staying close, 4–5 seconds behind. In the last 500m Limo upped a gear and went on to win leaving second place to Regasa, 4 seconds behind. Four runners closely contested third until Eric Sebahire overtook Kenendy Kipyeko. Altogether more than 1600 runners took part.